Haven't made a post here in a while. Earlier I had made a thread monitoring my outdoor Texas mini bog progress. Let me give you the final update now: FLOP. As a matter of fact, most of all my attempts to grow these plants have been just that: big old flops. I have owned several plants without the means to grow them and I have gotten tired of killing stuff. So I thought I'd do it right for once. This is the Chilling system parts. Im going to circulate cold water to a radiator w/ fan inside an exoterra tank (S/O Vraev for his inspirational build). the chiller is 1/10 HP and the controller gets down to 32 Degrees farenheit. It's largely oversized for my water volume so I can hedge my bets that the heat exchange is sufficient to drop the air to the low 60s/high 50s. Tomorrow I'm going to pick up a temp probe, a stand for the terrarium (I have it already in the garage), some 1/2" tubing and a 1/2" fitting for the pump. I also bought some glass drill-bits and a drill guide for putting some holes in the side of the tank to run the inlet/outlet chiller lines through. Will update soon. Would appreciate any critical input to the design. I'll post "Blueprints" tomorrow. Last edited by Hamata-Honzo; 01-12-2018 at 06:18 PM. Bit of a hiccup, the compressor wouldn't start. I guess claims of 'New, without Box' basically means 'does not work.' Should be getting in a brand new chiller this friday. still need a nice-enough stand to fit the tank. I have decided I'm probably going to put a piece of glass on the top and rill two holes in it to run the chiller lines through. I just dont want to risk drilling the main. Good luck, trying to fight the local conditions can't be easy, especially in Texas. I don't have much in the way of advice but one thing that could be useful is one of those magnetic algae scrapers that they use to keep fish tanks clean. Something like that would probably make maintenance a bit easier once you have the tank populated. I replaced the chiller and the new one chilled the reservoir to 45 degrees in about half an hour. Does anyone have experience with repurposing aquarium LED with CP? I have two Kessil A360w tuna blue and one Kessil A360we tuna blue and would love to use these if they will be enough spectrum wise (I'll adjust them to majority white light). I know the horticulture lights by kessil work well, but these are the strong aquarium ones. Please say yes lol, I don't want to buy another light but I want red plants. Last edited by Hamata-Honzo; 01-19-2018 at 01:14 AM. Long overdue update (I post mostly on flytrapcare forum now) Just gotta add plants! Great job. I am glad I was able to inspire someone. My chiller is currently down. I ran into a lot of plants dying as well. However, there may be a multitude of reasons for this. I also wasn't very happy with my chiller setup. It used to cycle on and off constantly. I turned it off around November of 2017 and bought a brand new pump that has been sitting around since then. lol. I need to improve the cooling system with a bigger reservoir, better insulation and make the system a lot more streamlined/aesthetically pleasing. I do not use those particular LED, but I do use aquarium LED exclusively for my plants. All my tanks now run on ecotech fixtures. From what I have "read", Kessil's are pretty good. They will give you the blue and red ends and given that they are reef fixtures, you will have the UV end of the spectrum as well. Most of our plants "should" be okay. personally though, I would add in a DIY fixture or something using perhaps a rapidLED system to add "white" led to your setup. Then you should be set lighting wise. The kessils are crazy powerful. I think you have to turn them down to prevent excessive light form retarding the growth of your plants. Last edited by vraev; 05-20-2018 at 11:46 PM. Great post Honzo! 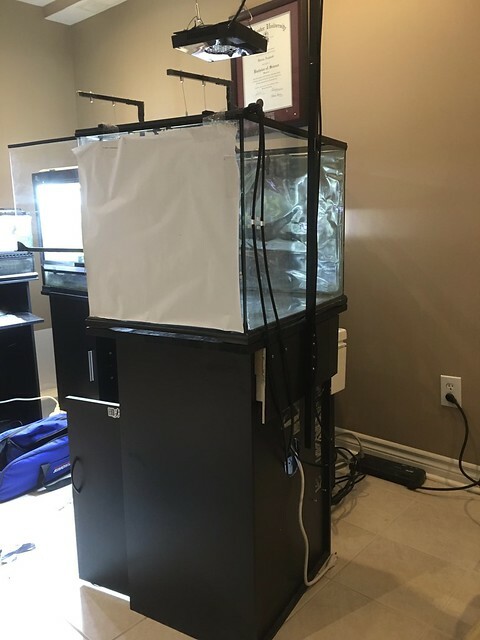 I have been looking for quite some time for someone who has attempted using an Aquarium Chiller and a radiator/fan to cool a terrarium. 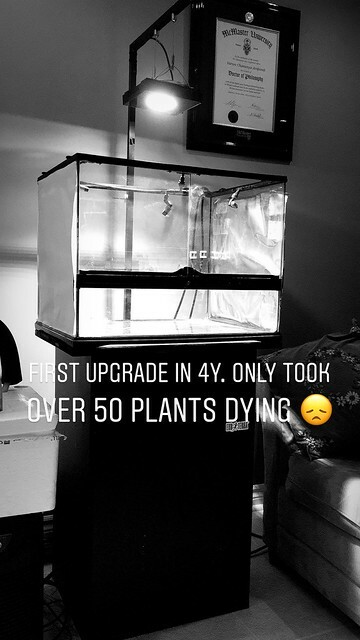 Can you please post a material list of components and maybe some more specs on how well you are able to cool your terrarium? What size Eco Terra did you settle on and how cool can you get it down to in there at night with the chiller running? Any more recent pics? This setup looks sooo cool! !